Pura Vida, mural in Costa Rica, March 2019 for an artist residency. Painting a spiral staircase created a challenge—having to consider how the art would work in a flowing space that can’t be seen all at once, but is revealed as you move (also ladders won’t work on stairs). A 6-color piece approximately 18 feet long and 9 feet tall. A Classic Never Goes Out of Style, 55 x 15 foot mural on textured brick, done with a historical theme about the Town of Highland. Tree of Life, mural at co-working space for the Jewish community in Chicago. 9ft tall x 18 ft wide. Border and frame define the conference room white boards using leaves and twigs that coordinate with the large mural. 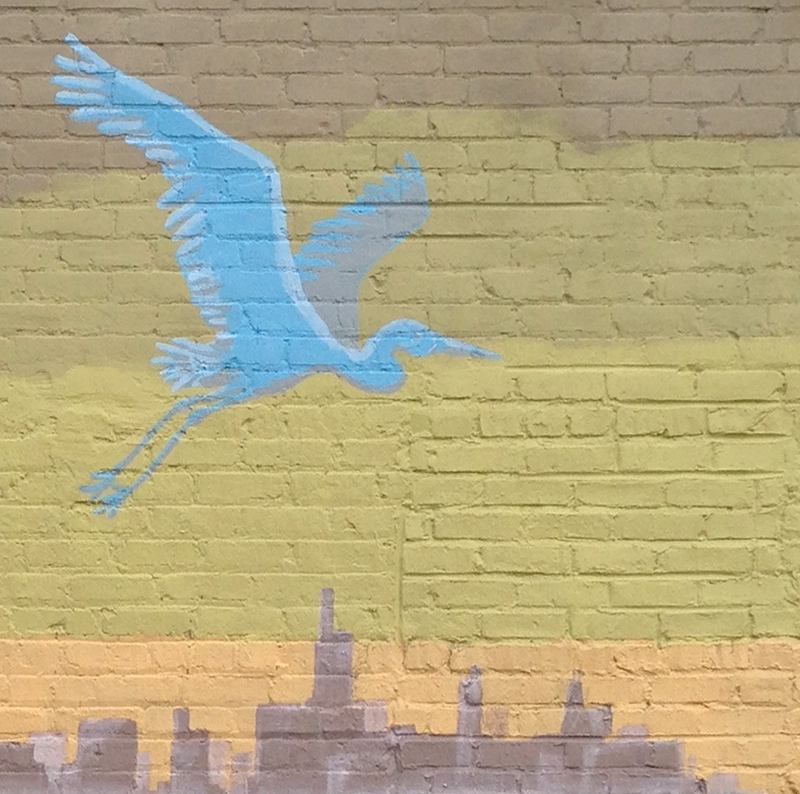 This mural, Wake of Happiness, was painted on an entryway wall for the Chicago Workforce Center at 1700 W. 18th Street, in the heart of Pilsen, Chicago. Façade graphics for Towle Theater in Hammond, IN show a timeline for their tenth anniversary. 3M transparent window film was used so the view from the interior was unaffected while the exterior view is opaque.